One of our favourite moments this month was meeting Giorgetto Giugiaro, who’s busy buying up examples of his classic designs – including the brilliant Alfasud. 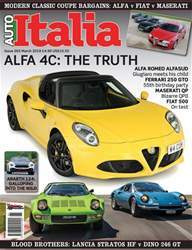 Another accomplished Alfa is the 4C, an often-misunderstood mid-engined masterpiece – and we tell you exactly how to make it perfect. There’s more mid-engined genius, too: our Dino 246 GT/Lancia Stratos face-off. Two further Alfas pop up in our 1990s coupe back-to-back, featuring cars that are very much on the rise in terms of value but still in bargain territory. Add in a Ferrari 250 GTO Tour, plus drives of Maseratis, Abarths and the latest Fiat 500s, and it’s yet another month of Italian car heaven.